Travel guide to the Gold Coast Australia | Best coffee, best beaches. We were asked by the best barista in Canberra (you know who you are) for our travel tips for the Gold Coast and we were like ahhh we have so many! We were going to email them and then thought why not publish them all here?! So here you go! The best (duh) travel guide to the Gold Coast Australia! Yes, the cafes and restaurants are all kinds of epic, although we’ll pass on the theme parks any day and you’ll rarely catch us in Surfer Paradise (pretty sure we’ve been there twice in the last 2 years). We’ve lived here since early 2016 and wow have we fallen in love with the Gold Coast. It took us a little while but this year we finally opened our eyes to the Gold Coast’s true beauty and soul… the beaches and the waterfalls. So this is exactly where we will start! The Gold Coast has the best beaches in the world… really! 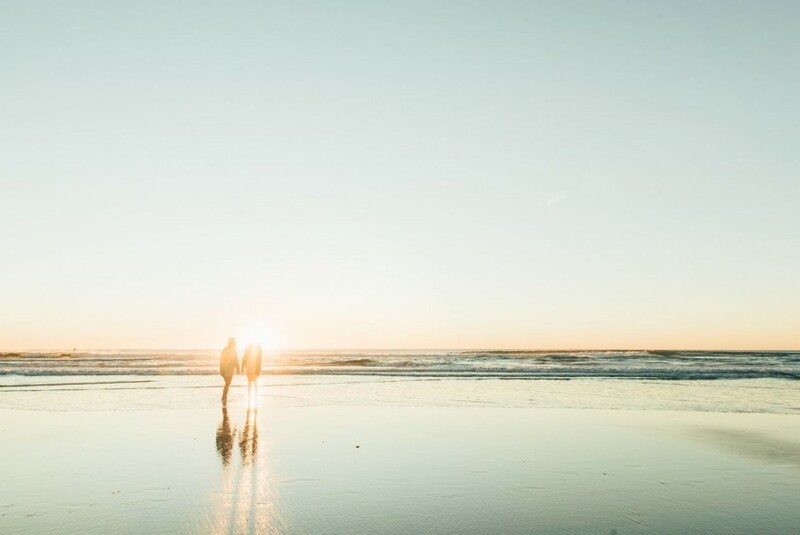 Our favourites are ‘out the front’, Mermaid Beach, down to Miami beach near the headland, Burleigh and then even further south to watch our boyfriends surf and yes, we can thank them for really showing us the magic of the Gold Coast. Give us sunshine, sand and salty water and we are happy. Also, if you’re visiting the Gold Coast beaches in September and October you’ll definitely see the humpback whales on their annual migration. This never ever gets old! When they come in close to the shore it’s the most amazing thing to see. If you have kids or maybe you don’t like waves checkout Tallebudgerra Creek. It gets really busy on the weekends but if you go super early it’s bliss (remember in Summer the GC sunrise is about 4:45 am, it seriously feels like Midday when you wake up!). Burleigh headland, Tallebudgerra walk, this is the perfect walk if you don’t feel like driving far. Our guess is that you’ll probably be staying close to Burleigh or making a visit. Make sure you do this short headland walk! If you want an epic workout… run it, then swim at Tallebudgerra Creek. Currumbin rock pools are the perfect option for families and if you’re limited on time. It’s a short drive inland (15 mins from Currumbin beach) and you can literally just park and see beautiful natural rock pools and waterfalls. And yes you should jump in. If you have time and love walking/hiking you’ve got to go visit one of the below (or all of them!). All of these are a little further out from Gold Coast but so worth it! Make a day of it. Wear comfy shoes, pack water, swimmers (always) and get ready for nature magic. Minion Falls, it’s further down south, close to Byron Bay and so so so beautiful! You can park and you’ll be at the top of the waterfall and it’s just magical! Or you can walk down to the bottom. Spectacular. Cedar Creek Falls, part of the Tamborine Mountain area and definitely bring your swimmers for this one (actually you really should always have your swimmers in your bag!). Our only recommendation… go during the week as it gets way too busy on the weekend. A bit of a drive to get there but a short walk to the waterfalls and swimming holes. Curtis falls, nearby Cedar Creek falls (we did both at once). Such a beautiful walk with amazing flowing waterfalls. Sure is something special about walking amongst the old tall trees. Read more here. Mount Warning, we did this in winter to watch the sunrise. Probably one of the best mornings of my life looking back (Emma here). My boyfriend and I stayed overnight in Cabarita woke up at 3:30 am drove to the foot of Mt Warning, pitch black sky, sparkling stars with headlamps on. It took us about an hour and a half to the top at a fairly fast pace. The last section is really hard! Literally, you are almost climbing vertically with a chain to hold on to! A great challenge! Bring warm clothes in winter and gloves, my fingers froze. Natural Bridge, in the western part of Springbrook, part of the Gondwana Rainforest. This place is AMAZING! Heading there at around 7.00pm, take the short 1 kilometre walk down to the Natural Bridge and you’ll see this epic, powerful waterfall along with a cave of glow worms and fireflies! :O Just magic! Read more here. For the best coffee on the Gold Coast head to either Background in Mermaid Beach, Borough in Burleigh Heads (take away only) or Barefoot in Palm Beach. Also epic food! BSKT cafe in Mermaid Beach. perfect location at Nobby’s Beach. They also do delish dinner on Friday and Saturday nights. Elk espresso, not actually for their coffee because they don’t have Coco Quench Coconut milk (yes we are those people and Milk Lab coconut milk is urgh and has added sugar.) BUT their food is delish! And if you have almond milk or regular milk coffee you will love their coffee. If you’re further inland you’ve got to check out Caffe Republic. Super delish food, with heaps of paleo, grain free, gluten free, dairy free and refined sugar-free options. Ohhh we also love Commune in Burleigh Heads for brekky and coffee. Get the Forager if you’re there for brekky. Also, there is a super cute boutique shop next door. We’re not huge shoppers but always find something we love here. Cafe on Hedges is right on the beach in Mermaid Beach and you’ll get to snoop at all the McMansions on the way there. Seriously, some of the houses are so big it’s kind of outrageous. Lots of gluten free and healthier options with a big focus on local produce, you should definitely try the choc quinoa cookies if you’re just up for a snack. Plus, Coco Quench Coffee and Hemp Chai for the win! It won best cafe on the coast for 2018, go them. Paddock Bakery in Burleigh is really cute… the white picket fence will have you like :O and although they don’t have any coffee we like (the almond milk is too thick and no Coco Quench), their brunch and brekky options are yum and fun. Our pick is the smashed avo on gluten free almond bread! Marie Anitas is a complete gluten free bakery. Every morning they make like 10 different flavours of gluten free bread and it’s seriously heaven. We’ve tried the olive and garlic as well as the turmeric bread. They also have a huge selection of gluten free, vegan and refined sugar free treats if you’re up for an afternoon tea kind of thing. It’s on the Gold Coast highway which is a bit noisy but the gluten free factor makes it worth it! Next time we’re getting pastries for lunch! YES, gluten free pastries! P.s they do Coco Quench coffee. Cardomon Pod is like a vegan eatery, we go there sometimes when we feel like an epic salad or healthy pumpkin cheesecake and peanut butter cups (haha). You’ll find one in Broadbeach and one at the Brickworks. The one at the Brickworks has a full sit down menu and it really is delish. Especially the kofta balls! So many to choose from! Please send us all your food pics when you visit these places! Not in any order because they are ALL equally amazing! Hellenika, ok this one is first because hello… GREEK food! The best food and equally as important the BEST service. We’ve been so many times and they never ever disappoint us. Whenever we go to another restaurant we always compare their service to that of Hellenika’s and nothing ever comes close. If you go, you just must get the zucchini chips (no questions about it! ), saganaki, the chicken souvlaki, the pork belly and throw in a Greek Salad. Perfection! They also have a roof top bar which you should visit just before sunset. Iku Yakitori Bar in Burleigh Heads, our new fave place! If you are a lover of juicy meat this is for you! Japanese style meat cooked over charcoals. You can either sit at the bar and watch the chefs hard at work or sit at the low Japanese style tables. Etsu in Mermaid Beach, same owners as Iku. Modern Japanese food, best sushi and sashimi. Oh and their Japanese Gin Garden is probably our all-time favourite cocktail! P.s the doors to enter Iku and Etsu are kind of hidden… fun. Bonita Bonita in Mermaid Beach, the best Mexican on the Gold Coast (or like anywhere maybe!). They offer burritos in lettuce leaves for a healthier option and yes always get the guac and chips to start. Glenelg, again in Mermaid Beach. If you feel like steak this is for you. But also, the chicken dish is insanely delish. Rick Shores right on Burleigh beach, with the best views and tasty Asian flavours. Food designed to share and the perfect place to celebrate something special (like life!). Fish House, again in Burleigh! You should go here for lunch (or dinner, whatever), and enjoy the open windows, freshly caught fish and a glass of Rose. A bit more exxy but oh so worth it. Social Eating House, this is in Broadbeach! If you like share plates then you’ll love Social! We ordered the Charcuterie plate (oh so meaty and good), plus the chargrilled chicken with sides! Definitely fun to head there and then check out the many drinking spots around the Broadbeach city centre. We don’t go out to drinks that often… usually it will be dinner with a drink. But if you need a spot head to Hellenika rooftop bar. The perfect spot for sunset drinks. We’re also excited to check out Burleigh Pavilion. Opening in December 2019. While still a construction site, owner Ben May (of Sydney’s Manly Wharf Hotel and Bali’s Mrs Sippy fame) tells us the venue will be a reinvention of the classic, white-washed coastal pavilion, paying homage to the Gold Coast and our chilled-out lifestyle. Via The Urban List. OR, buy a bottle of wine and head to the beach! We’re actually not sure if it’s even legal to do this (is it?!). But you’ll get the best views. If you need more healthy cafes on the Gold Coast checkout THIS LIST, there are few not mentioned above. Enjoy your trip and hope our travel guide to the Gold Coast Australia was all kinds of useful!